Jessica Yarvis, Emma Webb and Lee Hutten claimed the gold medal in Enduarance at last year's event. 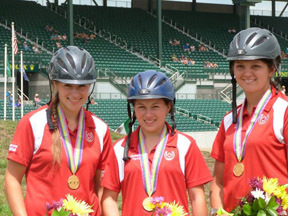 The Adequan FEI North American Junior and Young Rider Championships, presented by Gotham North, will be held July 17-21, 2013 in Lexington, Kentucky. The Endurance FEI CEI 4* will be held on July 19th. We wish these fine young athletes and their horses the very best of luck! Emma and Jessica will be returning to defend their Gold Medal performance in 2012, when they and teammate, Lee Hutten, crossed the finish line together to claim top honours at the first-ever FEI CEI 4* 120 km race – a very special moment for Canadian Endurance!